The fourth plinth in the northwest corner of Trafalgar Square was originally intended for a statue of William IV. The funds however, could not be raised and since 1998 the plinth has been used to display a series of specially commissioned, innovative artworks. This Fourth Plinth project, as it came to be known, has become internationally recognised in exhibiting first-class contemporary artworks in a public setting. The commissions are always ambitious, sometimes confrontational and often question the role that art plays in the public sphere. The programme continues to generate vast public debate about the city of London, the nature of art and how we are able to communicate through cultural activity. Marc Quinn's sculpture Alison Lapper Pregnant that was on display from 2005 to 2007 was one artwork that certainly gathered substantial public interest and global media attention. 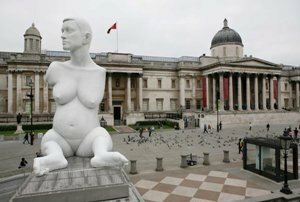 Carved out of white marble and standing over three and half metres high, the sculptural portrait quickly reenergised the traditional aspect of Trafalgar Square, pummelling it into the realm of contemporary, provocative art. However perhaps the work that has drawn the most response was Antony Gormley's One and Other which was on display throughout 2009. For 24 hours a day, 100 days in a row, different people occupied the plinth, filling the space normally reserved for statues of Kings and Generals with ordinary men and women. The 2,400 participants were chosen at random from the many thousands that applied. It was a representation of humanity and became a very popular commission that is still commented on long after its replacement. Some of the most celebrated and renowned national and international artists have proposed and made works for this well-known location in the centre of London. 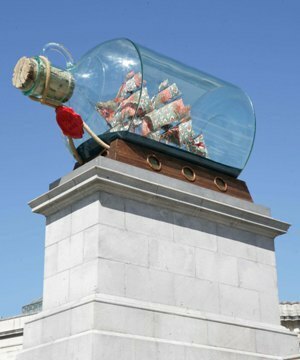 The current display is a replica of the HMS Victory in a giant glass bottle by artist Yinka Shonibare. It is a work of sheer genius that has many admirers. Funded by the Mayor of London and the Arts Council England, the scheme is a clever cultural strategy. The Fourth Plinth project makes creative use of an existing vacant outdoor space, gets contemporary art into visibility and through regular changeovers, allows a variety of work to be seen. It is a great, unique idea and an asset to the city of London. For more information on the past, present and future of the plinth you can explore the comprehensive website. Or get down there and check it out yourself, before it changes again. Why? There is nothing better than some public art to brighten up the city and spark debate.